Find more Calgary market information. Calgary gas prices fluctuate on a regular basis like they do in almost all cities and towns. The problem is though that you need gas to do your daily chores, such as going to and from work, visiting friends and family, and don't forget, shopping. And, similar to other cities, gas prices in Calgary seem to be forever on the increase rather than the decrease. If you don't want to or can't decrease your car usage, but you are beginning to find those gas prices getting a little too high for your budget, what can you do? Well in case you weren't aware, in 2005, Calgary was actually the ending place for the Green Caravan Awards race. The purpose of this race was not only to promote fuel efficiency in cars using traditional fossil fuels, but also it aimed to educate people about the alternative fuel vehicles that are becoming available. However, although switching from traditional fossil fuels to an alternative fuel seems on the face of it to be a good option, as it can save you money at the gas station, buying one of the alternative fuel vehicles can be very expensive. And so is the option of converting your current car from using gasoline to an alternative fuel source. So what else can you do to deal with those Calgary gas prices? Well if you're looking to buy a new car, and can't afford one of the alternative fuel vehicles, I'd recommend to check out the EPA gas mileage statistics for the cars in the group of models that you're looking for. This will give you a good idea of what you can "feed" before you head down to the showroom and fall in love with that great looking gas guzzler you can't afford. Calgary gas prices to high to afford a new car? 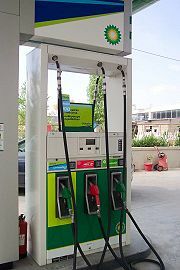 In case you're staying with your current vehicle, why not check out www.calgarygasprices.com if you haven't already. Here you can find the lowest gas prices amongst stations in your area. In addition, this site also shows you where you can buy the highest priced fuel, so you know where on the city map to avoid It might not be 100% up to date, but it does give you a good indication of recent prices. Keep an eye out for posted discounts. Many stations offer 3.5 cents off at the pump and others offer coupons worth up to 7 cents per litre purchased, redeemable in their store. For example, Superstore. If you shop there anyways, the bonus is significant and convenient. But don't forget the other thing you can always do. That's to hope for the best and maybe if we're lucky in Calgary gas prices may soon come down. Then again, we could all keep dreaming! Go back from Calgary Gas Prices to the Calgary Downtown Map webpage or visit the Calgary City Development homepage.